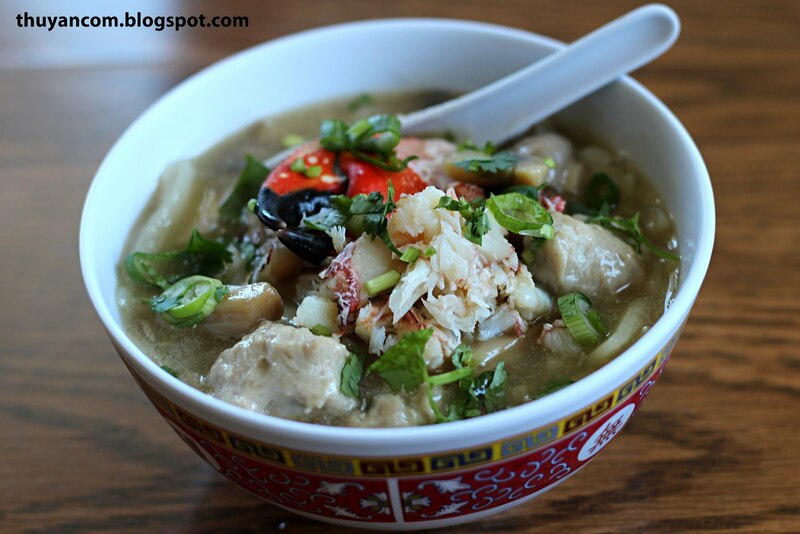 Even though I have already posted a recipe for Banh Canh Cua, this version is more authentic. The other version is like a quick fix, this version will take some time but it's definitely worth the extra effort. The other day I went to our local supermarket looking for ingredients to make dinner. I wasn't really looking for any specific ingredients, kinda hoping something would jump out at me. As I was walking through the seafood section, I notice a sign, "wild caught stone crabs". They were running a stone crab claws special for $7.99 a lb. There were around 4-5 five claws per package and each package ran around $7-$8. I knew this is what I have to make for dinner, so I grabbed five packages with the largest claws. After coming home, my sister-in-law looked through our freezer outside and dug up two dungeness crab parts. We use the meat a couple weeks ago to make Tamarind Crabs, and save the head with all the eggs for later use. There was no other option, these ingredients screamed Banh Canh Cua. Instead of buying premade noodles, I wanted to make the noodles from scratch out of rice and tapioca flours. Again this took extra time but it's really not hard. It taste so much better than the premade noodles. The broth is a little tricky because I use some left over ingredients and then frozen stone crabs. 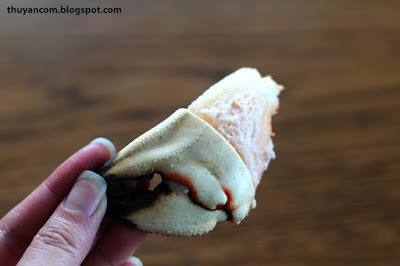 The frozen stone crabs are already cooked so it's not going to give off a lot of crab flavor. 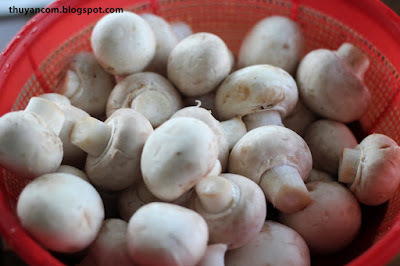 Using mushroom will also give sweetness and lots of flavor to the broth. 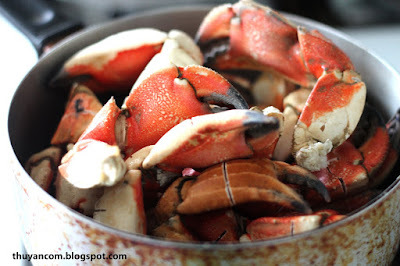 If you do not have access to stone crabs just use two whole dungeness crabs. On some occasion, Costo sells whole frozen dungeness crab for around $10 each. For this recipe, I'm going to list what I did with my ingredients (5 lbs of stone crabs claws and 2 head parts of the two dungeness crabs). Since most people will not have the heads of two dungeness crabs laying around, I'm also going to list the procedure if you were going to use two whole dungeness crabs. I'll try not to sound confusing but please let me know if you have any questions. Enjoy! 1. Sift together 3 cups of rice flour and 2.5 cups of tapioca flour. 2. Slowly add boiling water a little bit at a time to the flour mixture. With a wooden spoon work the flour and boiling water together. You want to add enough water to form a dough that you can knead and then flatten. 3. Once you have achieve a texture where you can mold the dough, split the dough into smaller balls (about the size of racketball). 4. 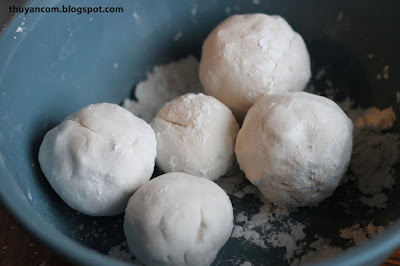 Use the rolling pin to flatten the dough balls and then cut the flatten dough in half. With a knife cut the half sheet of dough into 1 cm strips. 5. 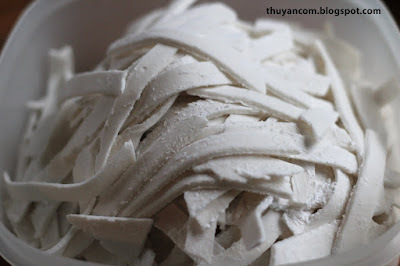 Store the noodle in a container and sprinkle tapioca flour in between noodles so it doesn't stick together. The additional tapioca flour will help thicken soup later too. 1. Steam the stone crab claws and save the liquid that is produced. Let the claws cool. move the pork from the dirty liquid and rinse under cold water. 3. Transfer the pork bones in a big pot filled with water. Let bones simmer in water up to 2 hours. 4. If you are using dungeness crabs, you want to remove the hard shell and scrape as much of the yellow content from the shell. You then would want to steam the crab meats and save the crab liquid for later. 5. Add the dungeness shell I just cleaned out into the broth. Add all the liquid produce from steaming the crabs. 7. Heat up some cooking oil in pan and fragrance the minced garlic and shallots. 8. Add the head/egg content of the two dungeness crabs to the garlic and shallots. Sauteed the egg content until fragrance. 9. Add the content to the broth, which will give the broth some color. 11. Taste the broth with additional fish sauce if needed. 12. Crack the claws and remove the meat. 13. Rough chopped the green onions and cilantro for garnish. 14. Like the previous recipe, you should prepare each bowl individually. Whenever you want to cook up a bowl, transfer the broth to a separate pot. Once the broth comes to a boil add the noodle and then turn down the heat. Make sure you stir the noodle around with a spoon or it's going to stick to the bottom. The noodle and extra tapioca powder will thicken the broth so add additional broth if needed. A small question for you? Do you open the restaurant yet? If no, think about it since you have talent to do so. If yes, then let us know. We still stop by if we get chance to travel to Indiana. Are you familar with cha chien (fried pork roll) or cha lua (steamed pork roll)? You can also add cha ca (fish cake) or shrimp. For more meat options use pork hock or knuckle, cook it with the pork neck bones until tender and then remove from broth. Add them in your bowl later. Hope this helps!